Located about a mile from our school, Black Dog Farm has supplied fresh organic produce to our school cafeteria for several years. Coffelt Farm supplies our cafeteria with amazing beef, lamb, pork, as well as veggies, fruits and herbs. Doe Bay Resort and Cafe also includes a large organic garden, and our cafeteria is often the recipient of some of their beautiful bounty. 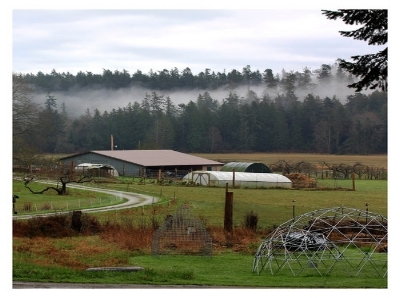 Jones Family Farm, located on Lopez Island, also provides amazing organic beef and pork for our school meals. Maple Rock Farm, the largest farm on Orcas Island was the first farm to begin providing salad greens for our cafeteria back in 2008. Farmer John has also been one of our Celebrity Chefs. Morning Star Farm in Victorian Valley on Orcas Island grows some of the most beautiful organic produce and herbs you can imagine. Orcas Farm, owned by George Orser, brings some of the best veggies, fruits and herbs to us for our Fifth Season event and continuously throughout the school year. Orcasong Farm is a new farm to the Island, which we featured for the first time this year during "Taste Washington Day." Bruce and Christina Orchid, owners of Red Rabbit Farm, have contributed food, time, talent and so much more to our program. Sara Ross and her daughter, Makala Forster, are the reasons our program exists. It was Makala who was the first to press for our program to happen in 2005. Taproot Farm continues to provide wonderful food for our program.